Google v. Hood, Section 230: The battle between the search engine giant and the Mississippi attorney general. The dramatic battle between Google and the Mississippi attorney general. 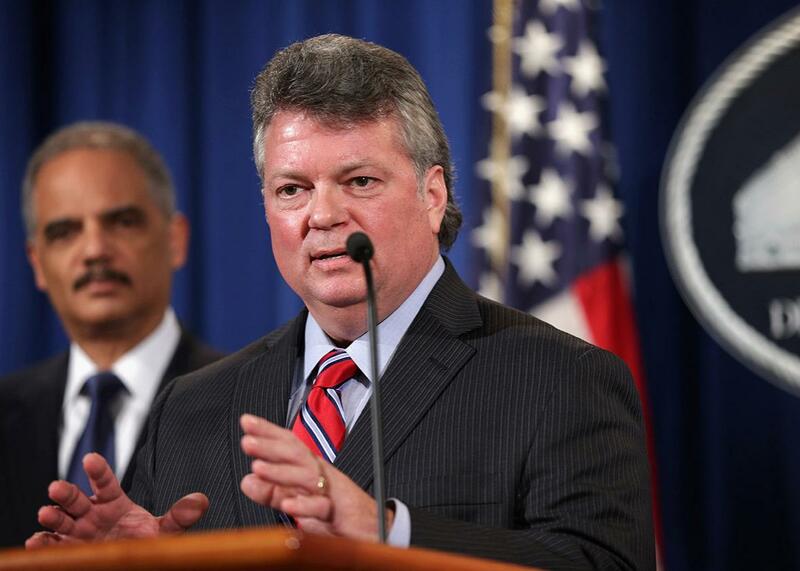 Mississippi Attorney General Jim Hood on Feb. 3, 2015 in Washington, D.C. The spat between Google and Hood is only the most recent manifestation of disputes over the role of online intermediaries. This article originally appeared in New America’s Weekly Wonk. A courtroom drama pitting search giant Google against Mississippi Attorney General Jim Hood is unfolding this summer in the 5th Circuit Court of Appeals. Fundamentally, the spat between Google and Hood is only the most recent manifestation of disputes over the role of online intermediaries. But Hood himself has referred to the details of Google v. Hood as a “salacious Hollywood tale.” The facts are stranger than fiction: A high-profile public official stands accused of colluding with the film industry in a secret industry plot to censor the Internet, thanks to information uncovered in emails released during the North Korean hacking scandal. The story begins in October 2014, when Hood’s office issued a hefty 79-page subpoena to the tech giant, requesting “141 specific documents, 62 interviews, and a catch-all request for any information relating to ‘dangerous content’ hosted on Google’s network.” Ostensibly, the request was part of an ongoing crusade by several states against online illicit drug sales, which Hood argues have led to a windfall of advertising dollars for Google. Google challenged the discovery request, alleging that compliance would be so onerous that it constituted a penalty in and of itself. The Internet as we know it today is a fire hydrant of online expression and creativity, and in part, this is because Section 230 shielded it from a crush of regulation and litigation that in its early days could have reduced that flow to a trickle. The law immunizes websites and other interactive Web services—known as online intermediaries—from excess liability for linking to or hosting third-party content. For nearly 20 years, Section 230 has been held to be a core pillar of Internet law, enabling it to become what Congress termed a “true diversity of political discourse, unique opportunities for cultural development, and myriad avenues for intellectual activity.” In fact, its protections were considered so central to the flourishing at the Internet that when the rest of the CDA was struck down as unconstitutional in the 1997 Supreme Court ruling in Reno v. ACLU, Section 230 survived. If prosecutors are allowed to enforce overly broad subpoenas like Hood’s, companies like Google would be forced to start limiting the speech of their users to avoid receiving such subpoenas in the first place. This kind of trickle-down censorship, exactly what Section 230 was designed to prevent, would threaten the First Amendment protections of both Google and its users. But of course, in this “Hollywood tale,” the plot thickens. A few months after Hood’s original subpoena went out, the Sony hack rocked Hollywood. Thousands of files were released, but a select few of these leaked messages revealed multiple exchanges between Hood and representatives of the Motion Picture Association of America. While the major Hollywood studios and a Mississippi public official might seem like strange bedfellows, “smoking gun” messages uncovered by the Verge reveal that Hood’s offensive against Google may have originated with the MPAA. Further analysis by the New York Times even showed that one letter sent out by Hood’s office on the subject of Google had mostly been written by MPAA lawyers. Actions taken by Hood’s office and the MPAA as the scandal unfolded suggest that they knew they’d been caught red-handed. Hood called a “timeout,” and when from the watchdog blog TechDirt asked for the release of emails exchanged between Hood’s Office and members of the MPAA, the AG’s office refused to do so unless TechDirt agreed to pay $2,103.10 in advance to cover “estimated costs” of fulfilling the request. Similarly, Hood’s alleged co-conspirators at the MPAA resisted requests to turn over documents related to their own exchanges with Hood’s office, expressing their shock and dismay when Google subsequently sued Hood and filed its own counter subpoenas of the MPAA in New York Federal Court. While outside observers can only speculate over the extent to which Hood and the MPAA are in cahoots, it’s clear that they have similar interests. Both parties were seeking to exert control over the Internet by ganging up on Google, one of the biggest online intermediaries out there. Beyond its melodrama, Google v. Hood also embodies a deeper ideological clash that persists between those who believe that Internet content must now be technologically and legally controlled and those who argue that it remain as open as possible in the service of free expression. Organizations like the MPAA and its analogue in the music industry, the Recording Industry Association of America, advocate for strict control, while technology companies (many of whom are the online intermediaries who would likely bear the costs of any control regime) and civil liberties activists want to preserve an unhindered atmosphere. Despite the clear provisions of Section 230, those attempting to exert control over online content and speech consistently target intermediaries like Google more than anyone else, and often do so through back channel lawsuits, which explains the triangulation of Hood, the MPAA, and Google. While the movie studios do not necessarily share Hood’s interests in the world of online drug sales, they are in a perpetual tizzy over the online piracy. From their perspective, by providing links to pirate sites (or links to sites that link to pirate sites), Google is a piracy enabler, and thus, the archenemy. While a market dominant search engine like Google might make the headlines with this kind of lawsuit, its core issue of Section 230 protections is even more critical for smaller entities throughout the Web. A smaller site might balk when confronted with legal action, realizing that hefty legal expenses could actually drive it out of existence. Robust free expression is so essential to the functioning Internet that overbroad efforts to control such speech, including procedural ones like subpoenas, are both illegal and detrimental. Hood may have initially envisioned his role as one of a crusading David against “Goliath,” as the ensuing legal proceedings between Google and the MPAA get uglier, but at the moment, he seems cast as a hapless extra in Clash of the Titans. This unproductive lawsuit is undoubtedly distracting in his duties as a public official of Mississippi. In the words of Hood himself, hopefully “cooler heads will prevail” in this latest fight over the Internet. Update, Aug. 17, 2015: This article has been updated to clarify a disclosure made by the author. Google executive chairman Eric Schmidt is a member of New America’s board; New America is a partner with Slate and Arizona State in Future Tense. New America has also received money from Google and Schmidt.